Over the last few months, I have been collecting and purchasing items for when the time comes to decorate our house. I figured that I would give you a preview of what I have purchased before they get discontinued, just in case you want to purchase them too! One of the first things that I purchased was the rug for the Family Room, which I know that I have talked about before, but, I am so obsessed with this Surya rug. It is so soft, and the color is amazing! 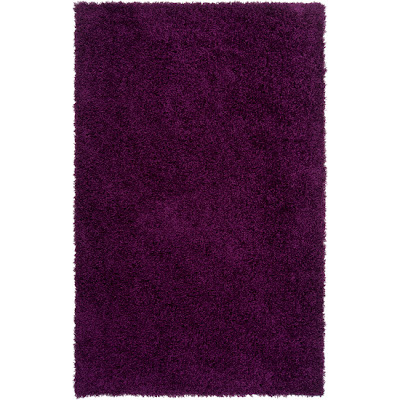 I purchased this rug after realizing that it was being discontinued, so the price had been slashed at an incredible discount. I was able to score the 8'x10' rug for $220, where it was originally listed at $770! Amazing, right?!?!?!?! Some of the sizes for this rug are still available from RugStudio, so you can still order this if you want it. Plus, it comes in other colors than the purple that I chose - normal colors, like brown, tan/camel, red, gray, and black. The next thing that I purchased was some wallpaper. You may be thinking that I'll be putting this on the walls in one of the rooms in our house, but you would be wrong. I'm actually thinking of adding the wallpaper on the staircase, under the stair treads. I think that having a little texture there would add something interesting to the staircase as your walking up it to the second floor. I ended up choosing a bunch of different patterns from American Blinds and Wallpaper and More, got samples of those patterns, and ended up choosing one of them. I think that this grass-like pattern will look really cool below the stair treads. 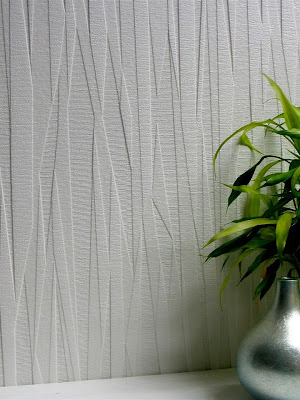 It comes in white, but to help not see the actual grains in the wallpaper, you are supposed to paint over it once you have it installed. I'm just going to stick with white so that it matches the rest of the trim work in the house. Next, is another rug. I had been looking for an outdoor rug for the sitting area in our backyard makeover for a long long time. I was originally looking for a yellow Greek-key rug, but couldn't find one in the right shade of yellow or one that was approved for outdoor use. I wanted to include it in my inspiration board for the backyard, but I just couldn't find one that I liked. One day, while randomly browsing Target, I came across their outdoor section, and lo and behold, I found this rug. It's not exactly what I was looking for, but the colors were spot on with what I was looking to do outside, and the rug is dark for the most part, which means that it will actually look cleaner over time since the dirt won't show as much. 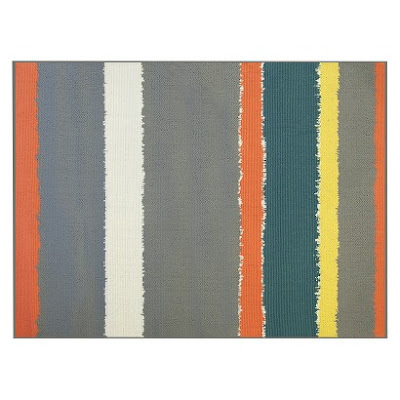 Plus, at only $60, it was hundreds of dollars cheaper than any other rug that I was finding, which is always a win-win! And the last thing for now is yet another set of rugs! Surprise surprise, right? Not really, I know. I've been looking for a few runners for the hallways on the first floor, so after looking for something with a pattern, I decided to just go with something plainer. The hallways will be painted with vertical light green stripes, so I figured that staying with a solid color rug in the hallways would be a better idea than having too many patterns in one small space. I found these great looking silver/light gray runners on Overstock.com and am hoping that they are going to look good in the space. I bought two different sizes since one hallway is longer than the other, but because of a sale that Overstock was having, plus a promo code, I only spent $105 on both, including shipping, which was actually free! I am now thinking that they will really look nice against a darker wood floor, so I'm excited to see everything put together. So, those are my most recent purchases, all of which are currently rolled up and being stored in the coat closet by the front door of the house. I can't wait to get things into place and see everything put together. I am really hoping that my visions on paper and on my digital screens actually looks good in real life. Have you made any awesome home decor purchases lately? Where are your favorite sites and stores to get a deal? Love the boysenberry color. It must look amazing in person! I love TJMaxx for unique finds and have just recently fallen in love with going the consignment shop route but not going to lie...Ikea gets me everytime!